Japanese folk metallers Yomi from Latvia have just released their third full-length album, entitled “Land of the Rising Sun“. The lyrics of the album revolve around the period of Japanese history between 1274 and 1281 – the time of an attempted Mongolian invasion. From the initial skirmishes at Tsushima to the infamous Mongol defeat by the Divine Winds (‘kamikaze’, in Japanese), the album takes listeners through battles, blood, fear and an occasional reflection upon the conflict, finally turning their attention to the indomitable will of gods, in whose power it is to bury many scores of enemy under the waves. 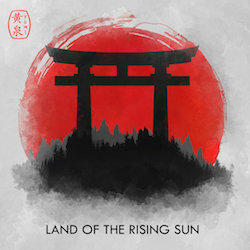 “Land of the Rising Sun” was self-released on November 9th, 2018, and is currently available in digital format on Bandcamp, Spotify, iTunes and other digital outlets. Physical copies are planned to be released at a later date.